How often do you need to replace your athletic shoes? More often than you think, according to Utah Jazz team podiatrist Dr. Michael Lowe. The use of proper shoe gear has a strong relationship to the performance and stability of foot function within the shoe. Those shoes which compliment foot requirements for stability, flexibility and shock absorption, can greatly aid in the dissemination of stress to foot and leg structure. The use of Springbak Springsoles in your shoes will greatly benefit all athletes for several reasons. The Springsoles have patented technology to reduce shock related injuries and give much more balance and stability to your game! This is the exact reason NCAA and pro athletes use Springbak in their programs. The amount of stress applied to the shoe gear before replacement with a new shoe also has a profound influence upon protecting the athlete. Most runners are encouraged to replace shoe gear every 350 -500 miles depending upon the size of the runner and his or her running environment. The same should be true of the basketball player. The average runner will spend about 66 hours in running to accumulate 500 miles on a pair of shoes (8 minute per mile pace times 500 miles). The average high school or collegiate athlete will work out easily 72 hours per month. Basketball shoes are now made of the same types of materials, i.e. eva or polyurethane midsole and a harder outer sole material. These materials all have a fatigue factor which greatly influences function of foot and stress delivered to bone and soft tissue structures. Players in the NBA will rarely use a basketball shoe for longer than 7-10 days before replacing it with a new pair of shoes (expensive). Springbak understands most athletes can’t afford to replace their shoes so often, but don’t skimp on cheap shoes or replacing them as needed. 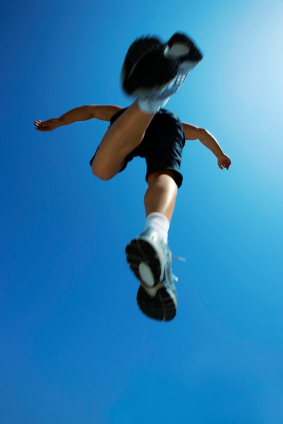 Always have and rotate 2-3 pairs of basketball or running shoes if you are a competitive athlete. A positive secondary by-product of frequent shoe change is that of a protective influence of shoe gear to foot and ankle stability to external forces. As the shoe is worn over hours of use the leather uppers slowly begin to stretch to the rotational forces applied. Also the midsole material slowly deforms or compresses to repetitive ballistic starting and stopping of play. As these external changes to the shoe continue the rotational movement of the foot within the shoe slowly increases in range of motion. Therefore it can be seen that with newer shoe usage, there will be fewer inversion injuries as compared to injuries due to the lack of support from worn and stretched shoe gear materials which lack the integrity to decelerate foot rotational movement beyond normal positioning. The use of a high top basketball shoe is still one of the best means for protecting the ankle from inversion sprains. NBA players choose a wide variety of shoe gear styles to play in; 68% of the players utilize a high top shoe, 15% utilize a 3/4 top shoe, and only 10% will use a low top basketball shoe for regular play. Your choice will be tempered by what is available and what properly fits and your athletic budget. DON’T SKIMP HERE! Article by William Crow – Former Professional Basketball Player and CEO Springbak, Inc.